This was part of the manor of Blechenham in Saxon times. The first part of its present name refers to ownership of the land hereabouts by the Knights Templar from 1243. The second part of the name may be a corruption of ‘fore-ton’, a farmstead that lay before somewhere – probably Hendon as one travelled from London. John Rocque’s map of 1754 was the first to identify Temple Fortune, when a single farmhouse stood here by a small green. Temple Fortune remained isolated until the arrival of the Finchley Road in the late 1820s. The Royal Oak was estab­lished as a coaching inn and terraces of cottages began to appear; two on Hendon Park Row are the only survivors. By 1880 most of the open land had been enclosed and in 1903 Eton College’s holdings north of Hampstead were divided into three farms, one of which was named Temple Fortune Farm. 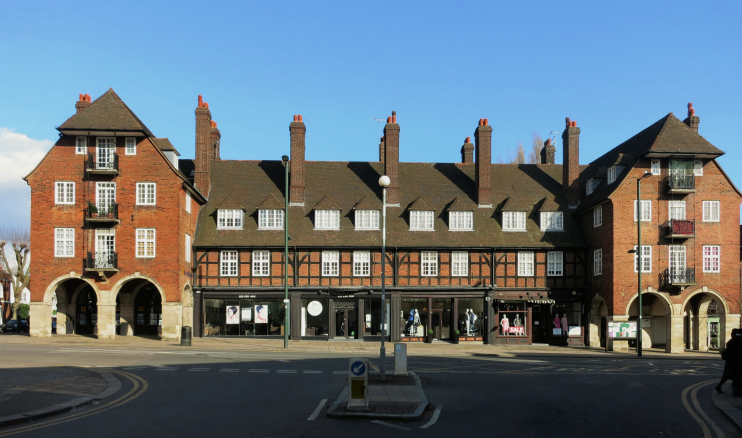 Within a few years the eastern side of Temple Fortune was developed as part of the ‘artisans’ quarter’ of Hampstead Garden Suburb and shopping parades with flats above were built as part of the suburb’s quirky philo­sophy of banishing commercial enter­prise to the fringes of the estate. The archi­tects Raymond Unwin and Arthur Penty took their inspir­ation for the parades from medieval towns like Rothenburg in Bavaria. Meanwhile, Golders Green expanded into the south of the locality following the opening of its station in 1907. Decoy Farm, which had occupied the north and west of Temple Fortune, was built over from the mid-1920s – and the Royal Oak was rebuilt around the same time. The capacious Orpheum Theatre (which was always a cinema) opened in 1930, became an Odeon in 1945, closed in 1974 and was demol­ished in 1982. On Cranbourne Gardens the church of St Barnabas replaced an earlier chapel in 1934. It closed in 1994 and two years later reopened as the Coptic Orthodox church of St Mary and Archangel Michael. The Royal Oak closed in 2006 and the building was remod­elled as a branch of Foxtons, the estate agents. Like its neigh­bouring local­ities, Temple Fortune is now popular with members of the Jewish community but its property prices have sailed out of the reach of artisans of any faith. Aida Foster founded a school of drama in Temple Fortune in 1927 and ran it until the 1970s. She later claimed that Elizabeth Taylor had been a pupil but Ms Taylor never confirmed this (though she did live nearby). EastEnders and Carry On star Barbara Windsor certainly attended the school, taking four buses to get here from Stoke Newington and feeling a little out of place among the well-heeled local girls. * The picture of Arcade House (built 1910–11) on this page is adapted from an original photograph, copyright Des Blenkinsopp, at Geograph Britain and Ireland, made available under the Attribution-ShareAlike 2.0 Generic Licence. Any subsequent reuse is hereby freely permitted under the terms of that licence.